1) Some teams joined forces by combining their predictions to obtain improved predictions (without disclosing their actual algorithms to each other). Today, for instance, the third best team on the Netflix Leaderboard is "When Gravity and Dinosaurs Unite", which is the result of two teams combining their predictions(Gravity from Hungary and Dinosaur Planet from US). This is an example of the "portfolio approach" which says that combining predictions from a variety of methods (and sometimes a variety of datasets) can lead to higher performance, just like stock portfolios. 2) AT&T, who is currently in the lead, takes an approach that includes 107 different techniques (blended in different ways). You can get a glimpse of these methods in their publicly available document written by Robert Bell, Yehuda Koren, and Chris Volinsky (kudos for the "open-source"!). They use regression models, k-nearest-neighbor methods, collaborative filtering, "portfolios" of the different methods, etc. Again, this shows that "looking" at data from multiple views is usually very beneficial. Like painkillers, a variety is useful because sometimes one works but other times another works better. Please note that this does NOT suggest that a portfolio approach with painkillers is recommended! Classification and Regression Trees are great for both explanatory and predictive modeling. Although data driven, they provide transparency about the resulting classifier are are far from being a blackbox. For this reason trees are often in applications that require transparency, such as insurance or credit approvals. Trees are also used during the exploratory phase for the purpose of variable selection: variables that show up at the top layers of the tree are good candidates as "key players". Trees do not make any distributional assumptions and are also quite robust to outliers. They can nicely capture local pockets of behavior that would require complicated interaction terms in regression type models. Although this sounds like the perfect tool, there is no free lunch. First, a tree usually requires lots of data: the tree is built on a training set; then, in CART trees the validation set is used to prune the tree for avoiding over-fitting; Finally, a test dataset is needed for evaluating the actual performance of the tree on new data. Second, a tree can be pretty computationally expensive to create, as a function of the number of variables. Building a tree requires evaluating a huge number of splits on all possible variables and their values (especially if they are numeric). The good news is that once the tree is built, scoring new data is cheap (unlike k-nearest-neighbor algorithms that are also very costly in scoring new data). As in any prediction task, the greatest danger is that of over-fitting. In trees this is avoided by either stopping tree growth (e.g., in CHAID type trees that are popular in marketing) , or by growing the entire tree and then pruning it. In the latter case, when comparing the full and pruned tree there will usually be a huge difference in the tree sizes. However, there could be cases where the two trees have similar out-of-sample performance: this happens when the data contain very little noise. In that case over-fitting is not substantial. You can find such an example in our book Data Mining for Business Intelligence ("Acceptance of Personal Loan", chap 7 pp. 120-129). 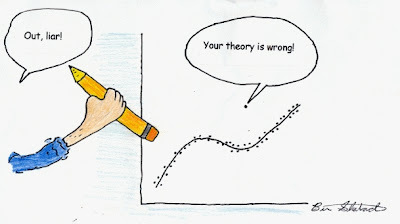 Here's one of the funniest statistics cartoons that I've seen (thanks Adi Gadwale!) First you laugh, then you cry. Also reminds me of the claim by the famous industrial statistician George Box "All models are wrong, but some are useful". The boxplot is one of the neatest visualizations for examining the distribution of values, or for comparing distribtions. It is more compact than a histogram in that it only presents the median, the two quartiles, the range of the data, and outliers. It also requires less user input than a histogram (where the user usually has to determine the number of bins). I view the boxplot and histogram as complements, and examining both is good practice. But how can you visualize a distribution of values over time? Well, a series of boxplots often does the trick. But if the frequency is very high (e.g., ticker data) and the time scale of interest can be considered continuous, then an alternative is the River Plot. This is a visualization that we developed together with our colleagues at the Human Computer Interaction Lab on campus. It is essentiall a "continuous boxplot" that displays the median and quartiles (and potentially the range or other statistics). It is suitable when you have multiple time series that can be considered replicates (e.g., bid in multiple eBay auctions for an iPhone). We implemented it in the interactive time series visualization tool called Time Searcher, which allows to visualize and interactively explore a large set of time series with attributes. Time Searcher is a powerful tool and allows the user to search for patterns, filter, and also to forecast an ongoing time series from its past and a historic database of similar time series. But then the Starbucks effect of too many choices kicks in. Together with our colleague Paolo Buono from Universita de Bari, Italy, we added the feature of "simultaneous previews": the user can choose multiple different parameter setting and view the resulting forecasts simultaneously. This was presented in the most recent InfoVis conference (Similarity-Based Forecasting with Simultaneous Previews: A River Plot Interface for Time Series Forecasting). In his May 2007 newsletter Stephen Few, a data visualization guru with an expertise in business data, created the The Graph Design I.Q. Test. "This brief I.Q. test leads you through a series of 10 questions that ask you to choose which of two graphs presents the data more effectively". I took it myself (and Stephen is probably tracking my answers!) 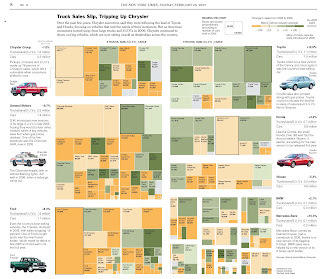 -- it's very cool and quickly teaches a good lesson in good vs. bad graphics and tables. You will be strongly discouraged after it to abuse color, 3D, etc. If you got hooked, Stephen has a big bag of goodies for those who want to learn about creating good graphs and tables. He wrote a beautiful book called "show me the numbers"
His website's Library also included an abundance of useful articles. You might ask yourself how on earth I have time for an entry during the last day of classes. Well, I don't. That's why I am doing it. The article focuses on the alarm that this causes in terms of "what happens when the government comes in and subpoenas it?" My question is, since every company and organization is mining (or potentially can mine) their own data anyway, what is the purpose of announcing it publicly? Clearly data mining is not such a "futuristic" act. What kind of "hidden patterns" are they looking for? the paths that readers take when they move between articles? what precedes their clicking an ad? Or maybe there is a futuristic goal? My colleague Ralph Russo often comes up with memorable examples for teaching complicated concepts. He recently sent me an Economist article called "Signs of the Times" that shows the absurd results that can be obtained if multiple testing is not taken into account. Multiple testing arises when the same data are used simultaneously for testing many hypotheses. The problem is a huge inflation in the type I error (i.e., rejecting the null hypothesis in error). Even if each single hypothesis is carried out at a low significance level (e.g., the infamous 5% level), the aggregate type I error becomes huge very fast. In fact, if testing k hypotheses that are independent of each other, each at significance level alpha, then the total type I error is 1-(1-alpha)^k. That's right - it grows exponentially. For example, if we test 7 independent hypotheses at a 10% significance level, the overall type I error is 52%. In other words, even if none of these hypotheses are true, we will see on average more than half of the p-values below 10%. In the Economist article, Dr. Austin tests a set of multiple absurd "medical" hypotheses (such as "people born under the astrological sign of Leo are 15% more likely to be admitted to hospital with gastric bleeding than those born under the other 11 signs"). He shows that some of these hypotheses are "supported by the data", if we ignore multiple testing. There is a variety of solutions for multiple testing, some older (such as the classic Bonferonni correction) and some more recent (such as the False Discovery Rate). But most importantly, this issue should be recognized. Adi Gadwale, a student in my 2004 MBA Data Mining class, still remembers my fetish with business data and data visualization. He just sent me a link to an IBM Research website called Many Eyes, which includes user-submitted datasets as well as Java-applet visualizations. The datasets include quite a few "junk" datasets, lots with no description. But there are a few interesting ones: FDIC is a "scrubbed list of FDIC institutions removing inactive entities and stripping all columns apart from Assets, ROE, ROA, Offices (Branches), and State". It includes 8711 observations. Another is Absorption Coefficients of Common Materials - I can just see the clustering exercise! Or the 2006 Top 100 Video Games by Sales. There are social-network data, time series, and cross-sectional data. But again, it's like shopping at a second-hand store -- you really have to go through a lot of junk in order to find the treasures. There is a host of metrics for evaluating predictive performance. They are all based on aggregating the forecast errors in some form. The two most famous metrics are RMSE (Root-mean-squared-error) and MAPE (Mean-Absolute-Percentage-Error). In an earlier posting (Feb-23-2006) I disclosed a secret deciphering method for computing these metrics. Although these two have been the most popular in software, competitions, and published papers, they have their shortages. One serious flaw of the MAPE is that zero counts contribute to the MAPE the value of infinity (because of the division by zero). One solution is to leave the zero counts out of the computation, but then these counts and their predictive error must be reported separately. I found a very good survey paper of various metrics, which lists the many different metrics and their advantages and weaknesses. The paper, Another look at measures of forecast accuracy,(International Journal of Forecasting, 2006), by Hindman and Koehler, concludes that the best metric to use is the Mean Absolute Scaled Error, which has the mean acronym MASE. I love data-mining or statistics competitions - they always provide great real data! However, the big difference between a gold mine and "just some data" is whether the data description and their context is complete. This reflects, in my opinion, the difference between "data mining for the purpose of data mining" vs. "data mining for business analytics" (or any other field of interest, such as engineering or biology). Last year, the BICUP2006 posted an interesting dataset on bus ridership in Santiego de Chile. Although there was a reasonable description of the data (number of passengers at a bus stations at 15-minute intervals), there was no information on the actual context of the problem. The goal of the competition was to accuractly forecast 3 days into the future of the data given. Although this has its challenges, the main question is whether a method that accurately predicts these 3 days would be useful for the Santiago Transportation Bureau, or anyone else outside of the competition. For instance, the training data included 3 weeks, where there is a pronounced weekday/weekend effect. However, the prediction set include only 3 weekdays. A method that predicts accuractly weekdays might suffer on weekends. It is therefore imperative to include the final goal of the analysis. Will this forecaster be used to assist in bus scheduling on weekdays only? during rush hours only? How accurate do the forecasts need to be for practical use? Maybe a really simple model predicts accuractly enough for the purpose at hand. Another such instance is the upcoming NN3 Forecasting Competition (as part of the 2007 International Symposium on Forecasting). The dataset includes 111 time series, varying in length (about 40-140 time points). However, I have not found any description neither of the data nor of the context. In reality we would always know at least the time frequency: are these measurements every second? minute? day? month? year? This information is obviously important for determining factors like seasonality and which methods are appropriate. To download the data and see a few examples, you will need to register your email. An example of a gold mine is the T-competition, which concentrates on forecasting transportation data. In addition to the large number of series (ranging in length and at various frequencies from daily to yearly), there is a solid description of what each series is, and the actual dates of measurement. They even include a set of seasonal indexes for each series. The data come from an array of transportation measurements in both Europe and North America.